What’s that? How good was it? It was so good that I made it twice in two days. I first made it on a Friday night for a girl’s night in (side note: it goes well with red wine). I liked it so much that I made it again the next day so Brian could try it. It was so tasty that I actually made it again a couple of weeks later so Mom could try it. Yep – I’ve made this three times now! I will admit that more than one person who ate this pizza said it was, and I quote, “The best pizza they had ever eaten.” Now, I know that whatever you’re currently eating is always the best, so I take this with a grain of salt. That being said, I love compliments, so thank you! My favorite part about making a mess of homemade pizza dough is that for a few days, I have quick easy meals that only take a few minutes and almost no effort to throw together. Take this pizza, for example. The only prep work I did for this pizza was to rough chop artichoke hearts and spinach, then pop the spinach in the microwave for a minute. That’s it! Oh, I guess I grated the fontina cheese, too. Still super easy! Pizza toppings! 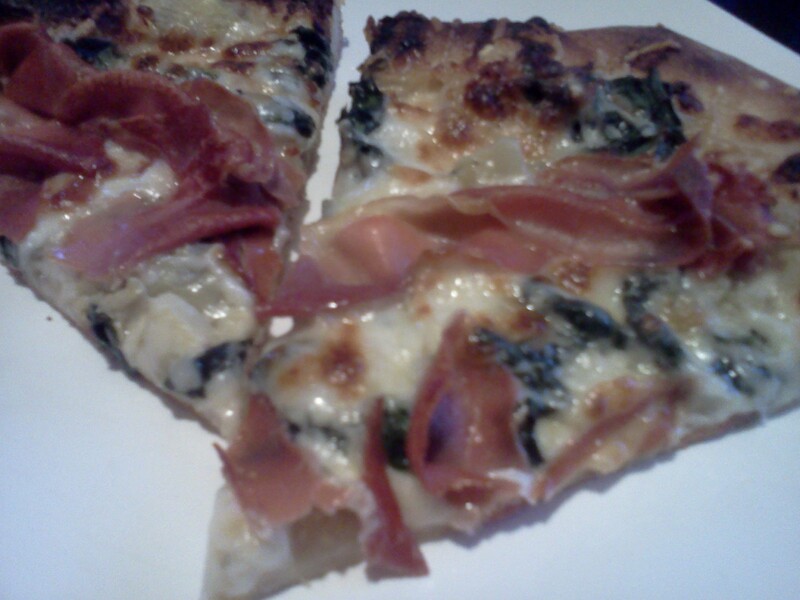 Roasted garlic sauce, artichoke hearts, spinach, three cheeses (fontina, asiago and mozz) and prosciutto. This stuff is awesome. Really. 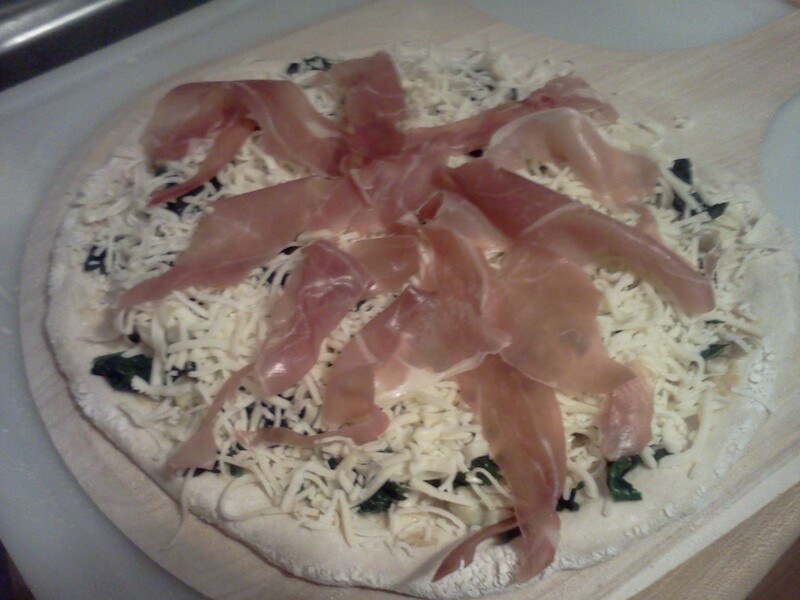 Here’s the funny part – I’m calling it a Spinach and Artichoke Pizza, but this recipe started with the prosciutto. I knew that my sister and my best friend were coming over, and they had been talking about prosciutto on pizza (Laura had tried my Butternut Squash and Prosciutto Pizza and was still talking about it). 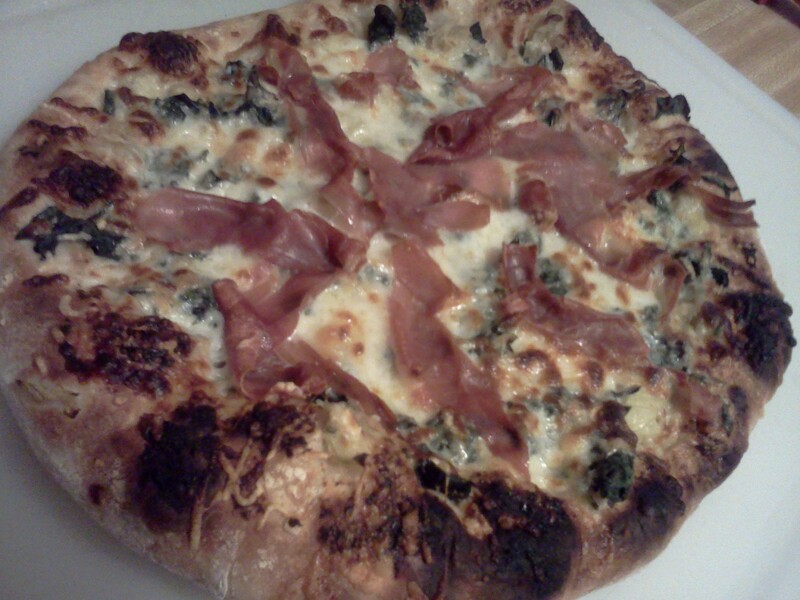 So I started thinking about what I hadn’t put on a pizza yet that would go with prosciutto. Of course! Spinach and artichoke! It makes a good dip, it goes well with cheese – done! I started with the garlic sauce, then the chopped marinated artichokes. I added the slightly cooked spinach (I microwaved it for a minute – just enough to wilt it so it wasn’t raw tasting) and topped that with fontina, asiago and mozzarella cheese. Fontina is one of Laura’s favorite cheeses, and it works well in a blend like this. I added the prosciutto last, but you could totally leave that off and have a kick @ss veggie pizza. As it cooked, it totally smelled just like good spinach and artichoke dip. Yum! The third time I made this pizza, I used baby spinach from the farmer’s market – super yum! I’ll have to remember this when I get greens in my CSA share. Maybe I’ll even try making my own roasted garlic spread – especially if the garlic I planted last fall does well! 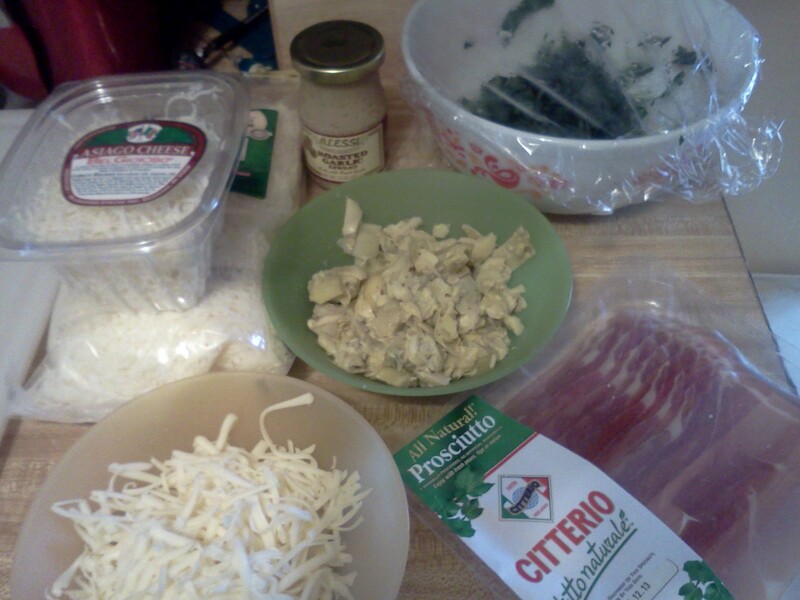 This entry was posted in Dinner, General and tagged artichoke, dinner, pizza, proscuitto, quick easy meals, spinach on April 5, 2013 by Melissa. This seriously was the BEST pizza I have ever had! I got lucky too and hd this pizza made for me! The crust was so delicious on its own. Everything about it was good! I am waiting for my next request, herb,parm cheese straws made out of the crust, I’ll be patient Melissa! I enjoyed making pizza at your house! It was a fun change. YUM! That sounds like a fabulous combination! 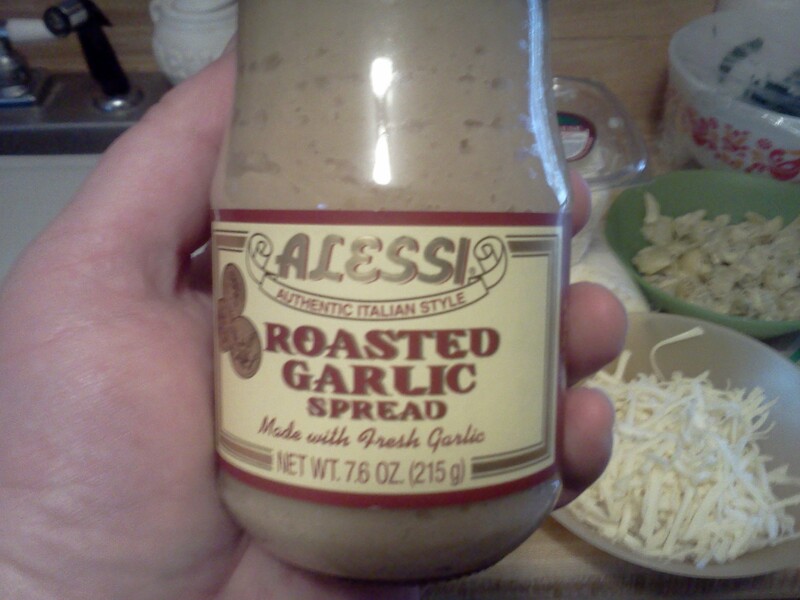 I have never had an Alessi’s product that wasn’t good, so I am going to try that garlic spread! Thanks! The garlic spread is amazing. It’s good on sandwiches, too! Yum! Sounds like a recipe for success, Melissa! Thanks, Kirsten! The combo worked really well on pizza. I love these flavors and have been toying with the idea of an artichoke pizza tonight. I think you sold me. Yippee! I hope you enjoyed your artichoke pizza!